Mark your calendars: You’re invited to Makeover Monday. And this week, it’s all about data skills—which are in huge demand, if you haven’t heard! New to Makeover Monday? In two words: It’s awesome. Makeover Monday is a weekly social data project, hosted by Andy Kriebel and Eva Murray, with the aim to help the data viz community learn from each other to improve their data skills. Each Sunday, a link to a chart and data set is posted here. Your challenge is to create a better version of the visualization in your own creative way. You’ll get a chance to tell the data story more effectively, or to discover something no one else has. There is no right or wrong way to participate. Hundreds of different people will join you for the event, with everyone sharing their results throughout the week for mass inspiration. Be sure to check out the #MakeoverMonday hashtag on Twitter, too, to see what everyone comes up with. 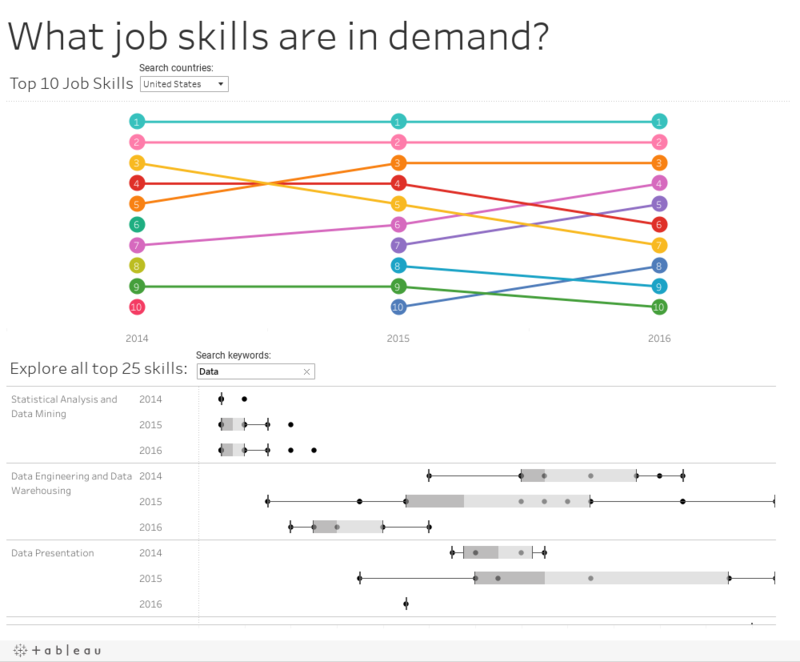 This week’s edition of Makeover Monday is going to be extra sweet, because the data set itself is about top job skills (and data skills are definitely in there). The topic comes from LinkedIn’s annual Top Skills reports from 2014, 2015, and 2016. This is not about criticizing the original authors. They are people like you and me, and they have feelings. Focus on the data, the charts, and the story. Focus on what works, what doesn't work, why those things don't work, and how you made it better. Consider time-boxing yourself to one hour. Just make something quick, there is no need to spend a day on creating a viz, unless that’s what you want to do, then we won’t hold you back. The purpose of the makeover is to improve on the original visualisation. Ideally, you should stick to the fields used in the original data set and improve upon it. Once you’ve perfected your creation, don’t forget to tweet a screenshot of your viz using the hashtag #MakeoverMonday. So, what are you waiting for? Dive into this week's data set! We can’t wait to see all the stories you tell about the skills employers are looking for.